A variety of animals are shown on this totem pole which was carved by a First Nations member of the Northwest Coast Kwakiutl. Done in a three dimensional form, the totem pole tells many stories by using animals, some which include ravens, bears, birds, frogs, whales and fish which were kin to the First Nations people. 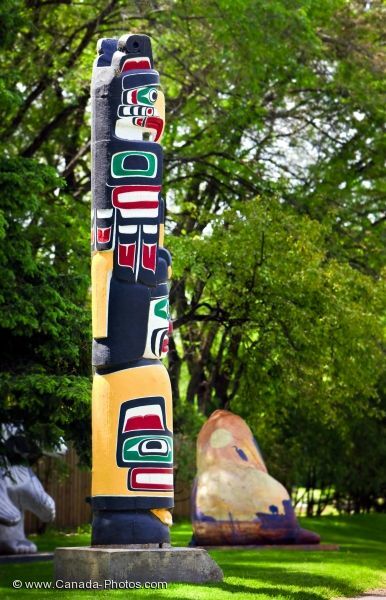 Using western red cedar as a foundation for the totem pole, the First Nations people creating the Kwakiutl totem poles use black, red, green, brown, yellow and gray as their colors to complete their artwork. Picture of a Kwakiutl totem pole created by First Nations at the Legislative Building in Winnipeg. ... in Manitoba, Canada for people to admire. Many tourists can not walk by this totem pole while touring the grounds of the Legislative Building without capturing a picture. Kwakiutl Totem Pole on the Legislative Building Grounds in the City of Winnipeg, Manitoba, Canada.